It's officially spring, but temps here in the Big Apple are still preventing my spring wardrobe from making its full appearance. Enter the above get up. 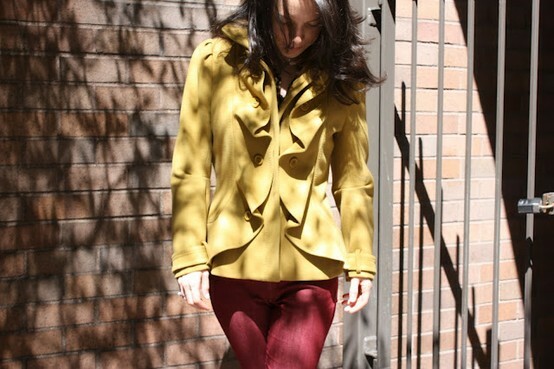 A fall palette of colors and a warm jacket coexisting among the sunshine and blossoming trees. It's a wardrobe oxymoron I tell ya. But I was happy to have a reason to debut my recent shopping haul purchases and take them for a test drive. Both the jeans and flats are keepers and have quickly been put into regular wardrobe rotation - which is having me contemplate acquiring other colors. I'm a "collector" - that's fashion justification at its best. I love pairing red and yellow! Some people here in Spain think it's tacky because it reminds of the Spanish flag, but I think those two colours look awesome together! By the way, I’m hosting a giveaway in my blog: a very unique totebag from Romerobags. Feel free to participate in http://diaryofamoderndaylady.blogspot.com/2012/03/modern-day-lady-first-giveaway.html . Good luck! I love the jacket! You look absolutely stunning with the total look!